take care of this moment. : .little nervous. 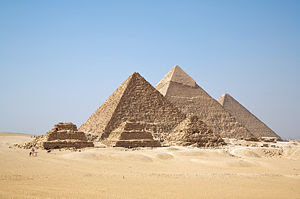 I am going to Egypt, you heard right, Egypt as in where the Palestines yesterday bombed the border and ran in for fresh water, food and cigarettes [we all have priorities]. We're also touring Israel for 2 weeks. I'm going with my parents and sister. I thought it sounded like so much fun and never really thought twice about safety until Bryan kept making me nervous by saying things like 'we gotta go get you a nice bullet-proof vest for your trip!' [As long as it fits cute and is pink and sparkly I say] I knew Bryan was just being overly protective and making a joke, but then I turned on the TV yesterday morning and every news station was reporting, this is basically what I heard/saw [click on link] Oh, crap! Little did I know that the Bin Laden's are holding a family reunion in Cairo, right where I fly into....And to think I was nervous about a couple machine guns...So what do you think am I over reacting? Can't decide...this one's kinda cute? I texted mom right after I heard the same news breaking story yesterday. Are we crazy? I love that Glamguns site. I just ordered April the Hello Kitty AK-47. I think that she'll really like it. I saw Bin Laden's son the last two days on TV with his wife. They were in Egypt. That is scary!!!! 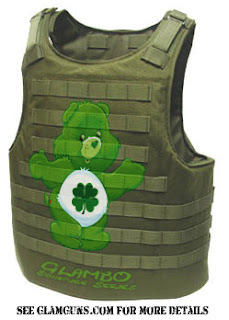 Personally, I would go for Funshine Bear, or Share Bear, maybe it would make all the terrorists extra happy! Don't stress too much, it will spoil all the fun of the trip! Just go with it Jaime, bury your head under the sand and have a GREAT time! k, you are too funny - I love your post! You guys will be just fine! That is scarey but your tour guide should totally know what's up! I am sure you can get a bullet proof vest with sequins and beautiful beading :)! How scary, but exciting at the same time. I am excited to see how your trip goes. Just get the beadazzler. I would be nervous too. Great to hear from you and you have the most adorable kids! Don't you just love blogging. It's so fun to hear from everybody. Good luck with the whole Egypt thing! I went on a quick tour of Egypt a couple of years ago and it was really cool, and very scary. I took a boat over and the second we stepped off the boat we were quickly escorted to tour buses where we had 2 armed (with machine guns) men on each bus and a truck with the bed full of guys with machine guns in front of the caravan, between each bus, and at the rear. They also did not let the buses stop when we went through any city so the local police would stop all other traffic so the tour bus wouldn't be a sitting target. You will see more machine guns then you have ever before (unless you have served in the armed forces). But seeing the country is an amazing, life changing experience, I have never seen anything like it, and be sure to take it all in, but it is a different world. I love the vest...green is a lucky color?! You'll have fun! wear the bear! i think you guys will FINE but a little extra protection can't hurt, right? PLEASE take a picture if you actually end up getting one (and make sure B. gets one too! ).